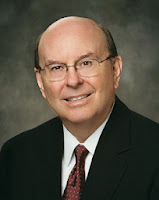 Elder Quentin L. Cook (b. September 8, 1940) was called as a Seventy in 1996, then as a member of the Quorum of Twelve Apostles in 2007. 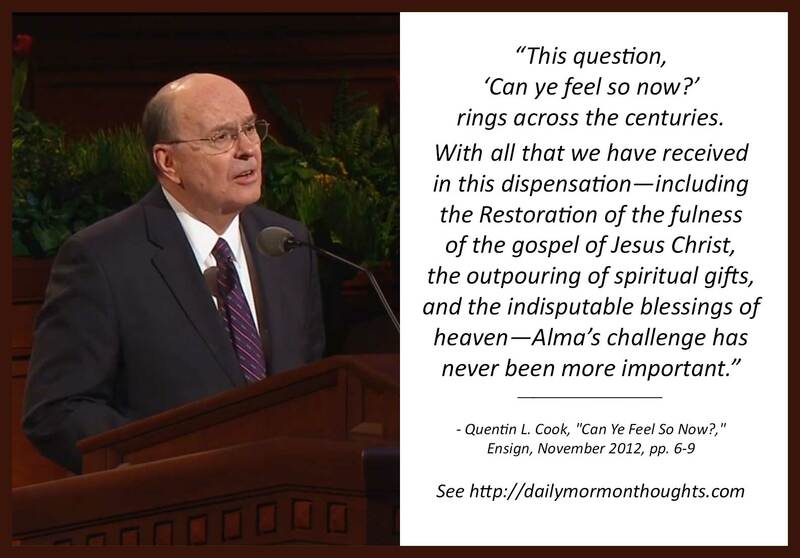 "Alma emphasizes that through the Atonement of Jesus Christ, 'the arms of mercy are extended' to those who repent (Alma 5:33). He then asks penetrating and ultimate questions, such as: Are we prepared to meet God? Are we keeping ourselves blameless? We should all contemplate these questions." I have always loved this verse in Alma 5, in the midst of the wonderful collection of questions Alma asks of his people. To experience a "change of heart" is one of the crucial steps in our spiritual progress. But in addition, Alma specifically mentions the experience of feeling "to sing the song of redeeming love"—a particularly beautiful expression describing our joy in acknowledging the Savior's love on our behalf. It's one thing to have felt the spirit, blessings, and joy of the gospel, of the Redeemer's influence in our lives; but are those feelings recent and current? We should have an active and vibrant spiritual life! 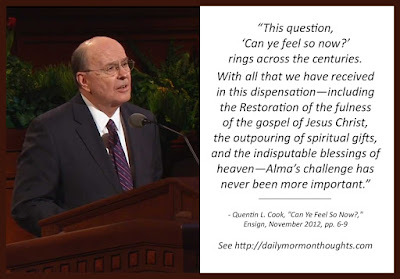 Elder Cook also mentions the equally moving expression that comes a few verses later in Alma's discourse: "Behold, he sendeth an invitation unto all men, for the arms of mercy are extended towards them, and he saith: Repent, and I will receive you" (Alma 5:33). Those divine "arms of mercy" are continually open and inviting, welcoming us back to His presence as often as we repent. Should we not do so now, that we may feel to sing the heavenly song again?